Say hello to the stunning results of CLARITY — a new technique that enables scientists to turn brain matter and other tissues completely transparent. It's already being hailed as one of the most important advances for neuroanatomy in decades, and it's not hard to see why. Cut off a mouse's head. Carefully remove its brain, wash it gently, and you'll wind up with something resembling the sample pictured above, on the left. Grey matter, it so happens, lives up to its name. Due in large part to molecules known as lipids, organs like the brain are usually opaque. Lipids comprise cell membranes and provide structural support to a variety of organs and tissues throughout the body – but they also scatter light. As a result, most microscopes are lucky if they can peer even a millimeter into biological matter before images in the viewfinder get blurry. One of the more popular techniques scientists use to get around this hangup is called "sectioning." It's brutally straightforward in practice: a researcher will freeze a chunk of tissue (a mouse brain, for example) in liquid nitrogen, and then slice it into scores of little sheets, each one just a fraction of a millimeter thick. This turns a single 3-dimensional problem (otherwise inscrutable, due to its non-transparent nature) into a series of 2-dimensional ones. Go through a brain layer by layer, and you can cobble together a volumetric picture of everything from cellular structure, to the spatial distribution of proteins, to the various connections that form between neurons. But the tradeoff is substantial. You're literally cutting your sample into a bunch of tiny little pieces. With every slice, tissue is deformed, connections are severed, information is lost. CLARITY does away with the slicing and dicing entirely. The technique, described in the latest issue of Nature by a team led by Stanford researchers Kwanghun Chung and Karl Deisseroth, works by stripping away all of a tissue's light-scattering lipids, while leaving everything else right where it belongs. You'll recall, however, that lipids play an important structural role in organs like the brain; if you remove them, everything else falls apart — a fact that has plagued past attempts at making tissues see-through. But that's where CLARITY is different. CLARITY works by virtue of a bait and switch. In their study, Chung and Deisseroth submerge a mouse brain in a mixture of formaldehyde and acrylamide. The former attaches important cellular structures and components to the latter, which solidifies into a gel when heated. An electrical current is then coursed through the gel, stripping it of anything not hanging on. The lipids go bye-bye, and the brain goes clear as Jell-O. More importantly: all of its significant structures remain intact and in place. Neurons, synapses, proteins, DNA. Every last component is exactly where it should be. The ability to strip a brain of its lipids and nothing else gives rise to remarkable research possibilities. 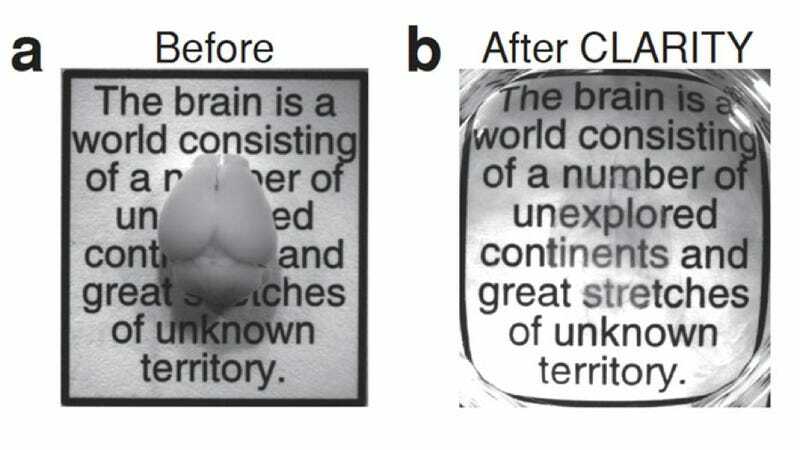 In the image above, a mouse brain turned transparent with CLARITY has been made visible again by labeling specific neurons with a fluorescent marker that glows green. Researchers have been using this technique (called "immunolabeling") to highlight certain molecular and structural features for years, but with CLARITY, labeled cells can be seen in three dimensions, all at once. In fact, the process of removing the brain's lipids actually makes the tissues more permeable, making it easier to not only tag them with fluorescent markers in the first place, but untag them and then tag them again with an entirely different label. What's more, the fact that you don't have to cut a brain up to see how it was stained means that you can add more tags to the same brain. The picture below shows a region of the brain known as the hippocampus that has had its different neurons labeled in a variety of fluorescent colors. A brain that was once impermeable to light has been made invisible, only to be made visible again – but this time with remarkable specificity. That last bit from Weeden isn't entirely true. To most people, CLARITY's clarifying effects probably look an awful lot like those of a chemical treatment unveiled a couple years ago by scientists at Japan's RIKEN research institute. In a study recounted in a 2011 issue of Nature Neuroscience, the researchers used a solvent called Scale to turn a mouse embryo (pictured above) almost completely transparent, and then visualize neurons and blood vessels in its brain in three dimensions. The difference, according to Chemical & Engineering News, is that CLARITY "appears to impart greater transparency to tissue [than Scale]... while maintaining the tissue’s structural integrity"
That said, Atsushi Miyawaki, who led the RIKEN research team, joined others in expressing his approval of CLARITY's usefulness – albeit in more subdued terms than some of the other researchers we've quoted here. "CLARITY," he told C&EN matter-of-factly, "will undoubtedly advance neuroscience." For a full description of the technique, and its applications, check out the latest issue of Nature. Images and video via Chung et al.